Origin is a dedicated United States brand who have been around the marine industry for the past 10 years designing, manufacturing and supplying wakeboard towers, racks, bimini tops and speakers to other brands around the world. Origin now supply their products direct to you. Enjoy time on the water with family and friends with an Origin wakeboard tower and accessories! 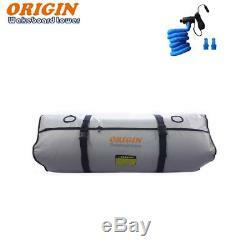 Origin Ballast Bags are an easy way to greatly enhance the size of your wake for wakeboarding or wakesurfing. Please note a single bag adds 550 pounds of ballast, there is 1 bag and 1 pump in this offer. 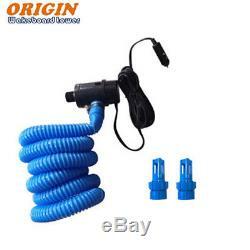 Origin Universal Ballast Bag 800 GPH Pump. You will easily be able to reach your bladder anywhere in your boat from your helm dc outlet with our super fast fill kit. This pump includes 12 feet of 12v wiring with an inline on/off switch and DC socket adapter, and 9 feet of heavy duty PVC non kink hose. Our kit will fill or empty your fat sac at 107 lbs per minute. Will fit most all ballast bag brands. Will fill or empty at 107 lbs per minute Super Fast 800 GPH Pump Powers up with a normal DC car lighter socket. 9 Feet of non kink tubing 12 Feet of 12V wiring and inline on/off switch. Dimension when water is filled in. L:50.4"(128cm) W:15.5" (39cm) H:15.5 (39cm). 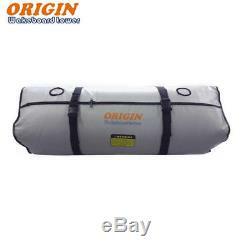 The item "Origin Surf Boat Ballast bag Fat Sac 550lbs+pump" is in sale since Thursday, February 25, 2016. This item is in the category "Sporting Goods\Water Sports\Wakeboarding & Waterskiing\Other Wakeboarding/Waterskiing". The seller is "originwakeboard" and is located in Azusa, California.